The cosy Hotel Daumesnil-Vincennes is located on the eastern outskirts of Paris, near the Chateau Vincennes and only 20 minutes from the Chams-Élysées. The Bonnet family has been running this 3-star house for 35 years, with great attention to detail. In order to offer the guests a comfortable atmosphere, modernisations have been carried out repeatedly over the years. Against the background of current changes in the hospitality industry, the operators wanted to send a clear signal during the recent renovation. 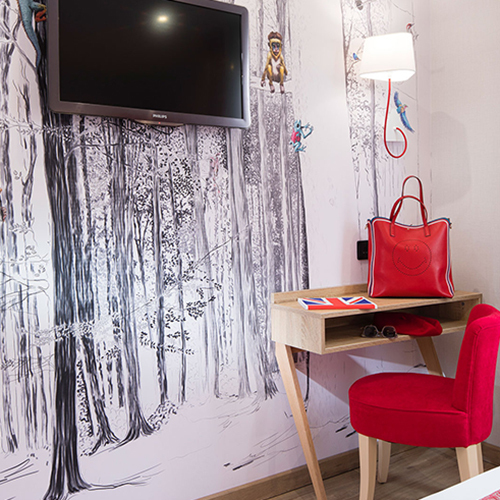 The new concept includes large wall cover designs with an individual style in each room. Modern digital printing makes it possible to create wall-sized motifs. The Paris-based digital printing company In Création could be enlisted as a partner. And the company name does not promise too much. Creativity is at work here. The graphic artists developed different image motifs, such as graphically designed forest landscapes, illustrative plant drawings, larger-than-life leaf structures or the appearance of raw concrete. This opens up a world of its own in every room. Large format printing was also carried out by In Création on the textile substrate Mediatex® JM AIR FR from Junkers & Müllers. This product is characterised by a number of advantages. It guarantees the highest print quality and does not exhibit stress whitening. JM AIR FR is particularly suitable for use as wall cladding, as the fabric can be applied with normal, commercially available wallpaper adhesive. Since the fabric is water and dirt repellent, the wall surfaces are very durable and hard-wearing. In addition, JM AIR FR is flame-retardant, which is particularly important for use in public areas. In the meantime, one year has passed since the redesign of the house and the owners are satisfied that the concept has worked out. This is confirmed by the high occupancy rate of the hotel and a lot of positive feedback from guests from all over the world. You can see Mediatex® JM AIR FR and numerous other Mediatex® products at the FESPA in Munich, the international trade fair for screen, digital and textile printing, from 14 to 17 May 2019. We are looking forward to welcoming you at our Booth A5 in Hall G35.